I was sitting in a Starbucks in downtown Toronto. In front of me a very enthusiastic newbie fempreneur potential client showing her Pinterest board she previously set up to visualize her brand. The board was HUGE so she was scrolling and scrolling fiercely and unstoppable, her laptop begging for more wi-fi and my vision getting blurry from all the colourful pins. This was new. Most of the time when I got a new branding project, the client arrived almost empty handed. I had to do the long process of picking her mind and getting the right inspiration for her brand. However, I quickly realized that having too much inspiration, too big input can be as problematic as having nothing. My new client stopped scrolling and sighed. And this is understandable. I bet that as a creative, multi-passionate entrepreneur you find that there are at least a quadrillion things that inspire you and your business. But you must narrow down the possibilities when it comes to your visual identity. You see, the problem is that narrowing down is hard. We all fell into the Pinterest trap at least once in our life – or hundreds of times if you’re more like me. We are just pinning and pinning for hours while our hubby snores on our side peacefully. A beautiful watercolour business card leads us to a French bakery interior that pops up a hand lettered logo and then comes a cute dog treat packaging. The board we named “Inspiration for my brand” quickly grows from a few hundred to a few thousand pinned photos, a level that’s hard to see through and hard to use when we really need guidance. And this is the main problem with “infinite-scroll” inspiration boards: they won’t give you the proper guidance to make easy and well-reasoned decisions about your visual identity. That’s why I think you must have a one-page brand inspiration board. Or as we call it in graphic design fields: a mood board. No, not an other Pinterest board to fill up. Think more about a letter size page, a carefully curated set of images that defines a distinctive style, that’s consistent and relevant to your business vision. Whenever I start a new branding project, creating this one-page inspiration board is one of my first step (beside interviewing the client of course). This helps me to design the logo, create the colour palette, pick the fonts and supporting imagery consistently. But there are other advantages than making a graphic designer’s life easier. A well-built brand inspiration board guides you whenever you have to make visual content, let it be photos for your Instagram account, Facebook ads, product photos or the featured image for your next blog post. 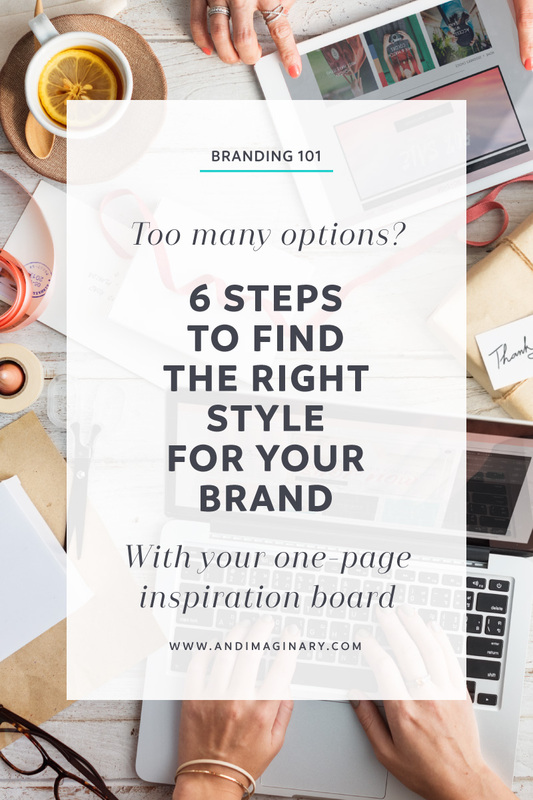 It also helps you find your own style: Instead of copying everybody and everything you like, you get a focus on the most important aspects of your visual identity. And the longer you follow this guidance, the more consistent, more distinctive your style becomes. Your follower will instantly recognize your newest gig, and notice it even in the flood of online content they have to face day-by-day. It’s also sharable and tells your story. No need to guard it in your drawer, quite the opposite. If you share your brand inspiration board, it can tell your story better than your best copy on your About Me page. A picture is worth ten thousand words. HOW TO FIND THE RIGHT IMAGES FOR YOUR BRAND? Ok, but how to find the right images and how to narrow down? – you might ask. I use the following 5 steps whenever I create a brand inspiration board. They help me two ways: either filtering the collected photos or finding better content that elevates my mood board from the ocean of generic fluff to superstar levels. Then start jotting down the values that your want your business to represent. This post from TutsPlus will help you see your core values crystal clear. Is this image relevant to how I envisioned my business? Does this image represent any of my values? Is this image [ … ]? Fill the blank part with the adjectives. I bet your vision included happy customers. Well, your visual communication must be in line with who you want to serve. Create ideal customer personas and imagine their style preferences. What would grab their attention? What style would make them feel comfortable? To learn more about how to build a persona / ideal customer profile for your business, watch this video from April Bowles-Olin at Blacksburgbelle. She has some seriously amazing tips on the topic. You might pinned all the powder pink bakery interiors but if you are planning to open a contemporary pottery studio, pink might not be the best choice to go with your extravagant creations. So always consider how will your product and services live in the environment you envisioned in step 1. What is the one word that describes the product / service the best? Is this photo relevant to that one word? How are the products / services different from the competition? Can I express this difference visually? Is the style of the photo relevant to my long term product / service strategy? Is there a story or tradition behind the product / service that I can visualize? You already accumulated a lot of material (for example on a Pinterest board)? Great, then go on a scavenger hunt and try to find repeating elements. Maybe it’s a colour that constantly grabs your attention. Maybe it’s a font type that you fell in love with. There must be similarities. Copy those images that showcase these patterns the best way and insert them into your mood board template or create a new “advanced” Pinterest board that only has these special pins. Sometimes you just have a hard time to find the right inspiration. This is when you have to step out your niche and look at other fields. Let’s say you want to open the above mentioned contemporary pottery studio. You already went through all the related artworks, gallery interiors and photos of smiling pottery artists… Now stop, and look up photos about geckos. “Geckos?” – you might ask. Yep, or anything unrelated to your business. My best inspiration comes when I’m on a walk and see a detail on a house or a vibrant colour in a front lawn. My best bet is always nature but of course there are so many human created beauty in our word. Just step back from your field, go for a walk or read (about geckos) on Wikipedia. And no hurry, please. You want to build a foundation for the visual style of your business. Inspiration takes time and the better content you get for your mood board, the easier it will be later. This happens so often: I find a beautiful mood board while scrolling through Instagram or Pinterest. I stop and then realize: it just looks as generic as the one hundred other collages I saw before. Chick photos nicely put together, but there’s no depth. But do you really want to be “just nice”? Even the guys at Walt Disney realized that the era of traditional princesses – who are of course all nice – is done. The new trend introduced Merida, Elza and Moana. Multi-dimensional, passionate girls who don’t give a poo about the handsome prince from the fancy castle. Question is, how can you be multi-dimensional in a 2D medium? It just takes a little bit of creativity, and doing things a bit differently. Even going offline and add something to your board from an other medium. Colors that play well together and relevant to the business vision, values and adjectives. Pantone or other color books can be a big help – but they are quite pricey – or you can go and check out this post on Creative Market about cool color palettes. My favourite is Color Hunt for it’s simplicity. Or go offline, visit the closest hardware store for some free color sample chips. Textures add dimension, inviting people to touch and feel (even though this might sound weird for something that mostly lives on screens). Patterns add playfulness and variety to any mood board. Check out my favourite surface pattern designers for new ideas: Bonnie Christine, Elizabeth Olwen and Little Smilemakers Studio by Maaike Boot. Typography can make your board look way more professional. The best you can do is to learn from the pros: grab some high-end magazines and look at how they play around with fonts, font sizes and weight, how they combine the headers and paragraphs with the photos. Your values – You already collected your values, and adjectives describing them. Why not to add it to your board? I always list them on the top, but you can be more playful and apply what you learnt from the magazine editors. Physical items – going offline and finding inspiration from ordinary objects or nature can boost your board into superstar levels. Physical items you can use: product packaging, fabric, tiles, reclaimed wood, vintage objects, analog photos (like Polaroid), crafting tools (washi tape, scrapbook paper, stickers, watercolour artwork, pottery, etc), handwriting on old postcards, details on furniture and buildings, print samples from digital printers (like Moo’s free sample pack), etc. Remember my client with the infinite-scroll Pinterest board? I ended up going through her long collection and I created 3 completely different boards. Each of them could work for her business perfectly. But as soon as the right photos got selected and grouped together, and the right words, colours, textures were added she could pick The One. So if you feel that you still have too many options, go ahead and create multiple boards. Then do a “gallery walk”. I bet you will instantly find the one that truly represents your business vision. What other tips would help you to create your inspiration board? So that’s it. I hope you enjoyed this post. Do you have any questions about this topic? Don’t forget to ask them in the comments or go to the Andimaginary Facebook page and share your thoughts there.